A deed in the possession of the Cemetery dated November 1873 shows the purchase of approximately 35 aces from Faxton D. Atherton for the sum of $900.00. However a sales contract had been signed in March 1870, which enabled the Cemetery Directors to sell lots to pay the balance of the purchase price. The original payment was made from money left in the account of the Hayward Home Guard, which had been disbanded after the Civil War. In 1924 the Cemetery was re-incorporated, and Directors were installed. President Margaret McLean Strobridge took firm control. The President and the rest of the Board were a group of dedicated, hardworking and public spirited citizens. Since 1924 there have only been six Presidents. Margaret McLean Strobridge from 1924 to 1940, Natalie D. Fry from 1940 to 1966, Erwin R. Jensen from 1966 to 1991, Arthur L. Larson from 1992 to 1994, Karen Jensen Comiskey from 1994 to 1996, and our current President Robert Mattos from 1996 to present. Many pioneering and prominent Hayward, Castro Valley and surrounding area families are interred at Lone Tree Cemetery, including the City of Hayward’s namesake, William Hayward. Some other families include: Strobridge, Proctor, Cull, Luce, Ramage, Prowse, Borree, Oakes, Manter, Cowing, Gansberger, Anway, Jensen, Mosegaard, Rowell, Cook, Garcia, Borneman, Drennen and Stewart. Lone Tree Cemetery also happens to be the final resting place of Karl (Charles) “Charlie” Becker, better known as the Mayor of Munchkin Land from the original Wizard of Oz. 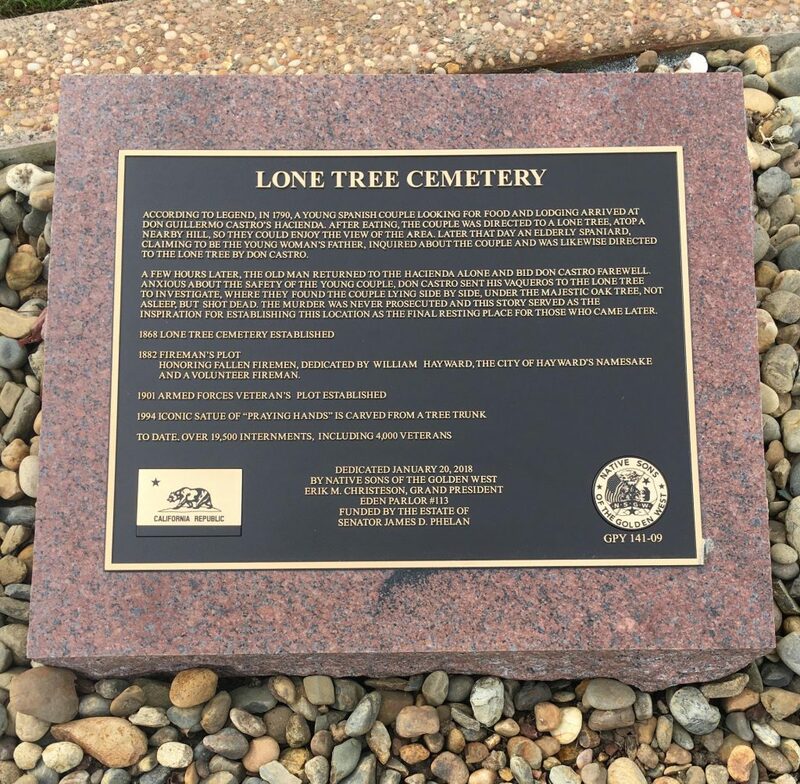 Lone Tree Cemetery Association is a non-profit association where the profits of the cemetery are put back into the ongoing maintenance, development and beautification of the property. The Association is managed by a Board of Directors.